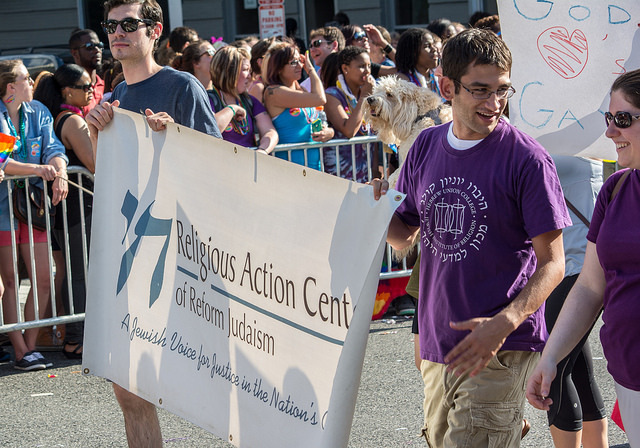 Reform Judaism is leading the way on affirming transgender persons in all parts of their religious and social beliefs, practice, and social justice activities. Photo: Tim Evanson | FlickrCC. In an overwhelmingly positive voice vote Reform Judaism embraced sweeping transgender rights policies. It’s the largest Jewish movement in the country and these are some of the most far-reaching policies adopted by a mainstream religious organization in the United States. The resolution includes cultural training for religious school staff, sermons concerning transgender issues, and the inclusion of gender-neutral bathrooms where possible. In addition, the resolution urges policy makers to make it easier for transgender people to change their names, update passports, voter registration, or birth certificates, be identified with the pronouns they prefer, and have access to the bathrooms of the gender they identify as. There are a number of states and municipalities that already do, or are seeking, to make all of this more difficult for transgender people, and having support from over 900 Reform Jewish congregations will be a big help. Most of those congregations were already welcoming to transgender people, but some will be addressing these issues for the first time. In 2003, the first openly transgender person was admitted to rabbinical school, and then earlier in 2015 the movement required all congregations to consider anyone for rabbinical positions, regardless of their gender identity. These are concrete steps towards equality, and the new resolution will go even further. Reform Judaism joins the Episcopal Church, the United Church of Christ, and the smaller Unitarian Universalist Church and Metropolitan Community Church in adopting policies towards transgender rights, but the movement has gone further than their peers. They have adopted specific policies and outlining specific actions to support transgender people. What’s especially uplifting about the decision is that it came with little controversy. It was neither a difficult decision for leadership, nor a hard vote to pass. This is an excellent example of religious toleration not just in word, but in deed as well.